Turkey burgers have a bad reputation, typically characterized as bland and dry. I am a fan of the humble turkey burger. It’s all about seasoning and bold flavor combinations. These Korean BBQ turkey burgers are the perfect example. They are packed with flavor, a little heat and fresh vegetable crunch. In this recipe, the flavor comes first from Gojuchang Barbecue Sauce from the brand Bibigo, and second, from a tangy carrot and radish slaw. If you are not familiar with it, gochujang is a paste found in Korean cooking made from red chili, rice, fermented soybeans and salt. It lends a sweet heat to dishes. 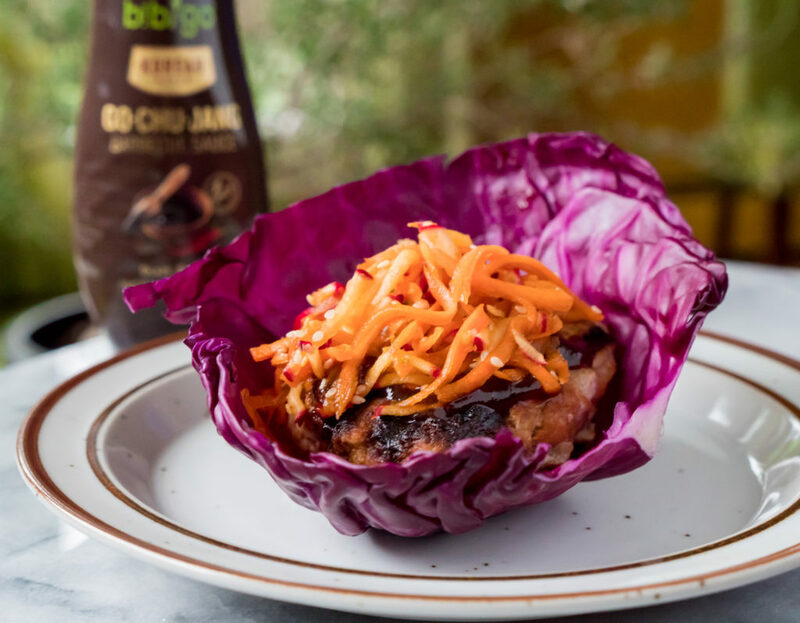 This sauce by Bibigo essentially combines that fermented sweet heat with everything you would expect in a traditional barbecue sauce. Think of it as east-meets-west. To match this sweet and savory sauce combination, I have created a vegetable slaw that further plays on the sweet, spicy, salty, and sour flavors. Then, to keep things on the healthier side, and to add even more crunch, I use red cabbage leaves instead of a bun. In a large bowl, combine the ground turkey, minced onion and barbecue sauce. Form four equally sized burgers and place on a lined plate. Refrigerate until ready to grill. In a small bowl, whisk together the sesame oil, tamari, rice wine vinegar, honey, crushed red pepper and sesame seeds. Set aside. While the burgers cook, in a medium-sized bowl, add the grated radishes and carrots. Pour on dressing and stir to combine.